A Spring black tail buck with horns still in velvet in pen and ink. This is always busy time of year around here, which is the reason I haven’t posted for awhile. When Fall comes, we disappear into the mountains. It’s our time to put some miles under our boots, over the mountains and through the woods. This is when we go out to procure some fresh organic protein to get us through the year. I photographed this buck last Spring. He was feeding under a blue oak tree. His antlers were still growing and in velvet. 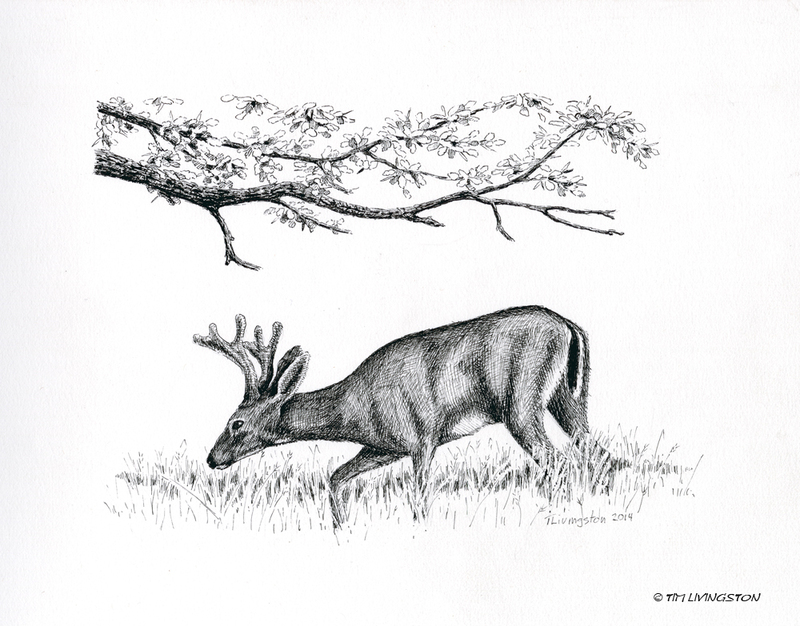 This entry was posted in Drawing, Pen and Ink, Wildlife and tagged black-tail deer, buck, deer, drawing, Forester Artist, pen and ink, Pen drawing by foresterartist. Bookmark the permalink. Thanks for the reblog Lisa! I have missed seeing your posts but I’m happy to hear that you’ve had some time away with nature. Fall is a special time of year. Love your drawing and the description of antlers of velvet. Sounds like a book title. Thank you Linda. There are never enough hours in the day to do all the things I need, or want to do. That’s an amazing work of art! Thank you very much Jonas! Tim, Always nice to see your art, great piece! Thanks Craig, I really appreciate your comment. Beautiful drawing Tim – nice to see you again. Sounds like you guys had a good time! Thank you so much Mary, we try! Thank you Susan. I hope to be around a bit more now. I always love seeing your artwork. Fantastic as always! Thank you Megan! “Fantastic as always”, that’s the claim I make to Mary every day! It’s a tough sell. Sounds like Mary is my kind of gal! Your drawing is beautiful, Tim! So up close and personal…love it! Thanks for sharing your wonderful drawing, you’ve captured a perfect moment. Thank you Sharon. Sometimes it’s all about the moment, and sometimes it’s the feeling or impression. I’m glad you liked it. Good to see your work again Tim. I love it. The shading is so good. Thank you so much Don. I haven’t had time to post much lately, but I think that will change now. I’ve plenty of work to post and now just need to do it.